The world’s largest surf demo benefiting the California State Parks… and …Lost will be there (in our RV) with tons of the latest …Lost surfboard models to demo, games and giveaways. Daniel will even get your photo riding the board and Rick came up with some kind of ball throwing game to win prizes. Even a special appearance by Chris Ward could possibly happen. 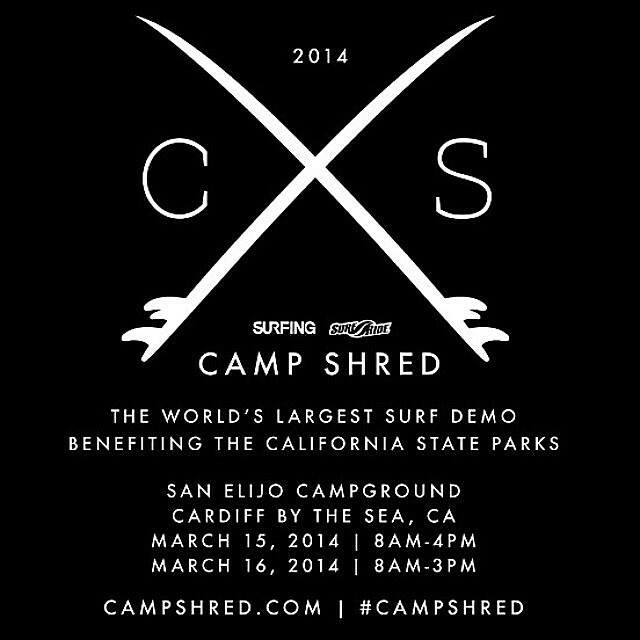 It’s all going down at the San Elijo Campgrounds at Cardiff By The Sea March 15th-16th. For more go to CAMPSHRED.COM. The groms were frothing on the 4’7″ Scorcher. They were in line at 8am sharp ready to rip. Jake Hennesy slashing on a 5’7″ x 18.5 x 2.2 V2 Shortboard which was originally shaped for …Lost surfboard rider Ale Moreda. Josh Sirota on another V2 shortboard shaped for Ale Moreda. 5’6″ x 18.65 x 2.25 . We had over 30 new boards to try out. The best model for the waves this weekend was the R.V. It is designed for extracting maximum fun with minimum effort. And Chris with his choice the R.V. (5’5″ x 20.5″ x 2.32″ | 29.41) in front of the R.V. All types of surfers made it out to the event to demo our boards. Here are two avid beginners in their quest for recreation. They ended up demo-ing or rather demolishing the brand new R.V. successfully. Couple of hot dogs for a couple of surf dogs. Both the V2 shortboard and Camp Shred attracted all types of people. Returning the board just the way they found it. And then stuffing their faces with cupcakes in hopes of receiving more free product. Good job punks, free swag well earned. Once the groms left we decided to play the ole fishing with Futures game. The only one who fell for it was the infant. We gave his parents a Here Today Gone To Cabo DVD for him to watch in a few years. Father and son surf stoked on trying out some …Lost surfboards. The little guy ended up liking his dads R.V. Chris Ward came on Sunday afternoon to give a few tips on what board one might want to ride. Chris Junior learning to sign autographs. Wardo signing some WARD STORIES posters. The crew at …Lost stoked to be a part of Camp Shred, and drink a beer at sunset.